The topic here is Fear. Fear related to unemployment then the crushing reality of not being employed. No, I haven't lost my job but tens of thousands have. Yahoo is distributing an article written by Ron Scherer for the Christian Science Monitor. It has most definitely hit a chord with most of its readers. Near on 2,000 comments to a article about a lady who is having her unemployment cut because she took a part-time job. Most of them are frustrating (aren't they always?) so it is hard to take a step back from it and see what is really going on. "What is that?" You may ask. "Well," I say "we are living through a challenging time." I should end the conversation with myself there because I sound crazy talking to myself. Even still, at the risk of sounding crazy-er, I'll continue on. The challenging time is one that was most likely brought on by bad home loans over the past couple decades. I'm not talking about auto loans or small loans to fix your deck. Not even credit card loans because most of those are due in part because of the center of the universe personal black hole loan that is a home. It's a six figure sum. A lot of times a sum that requires 30 years to pay off. It's not a bad thing that this is (was) allowed to happen. But I gotta tell you, home buying wasn't always like that. 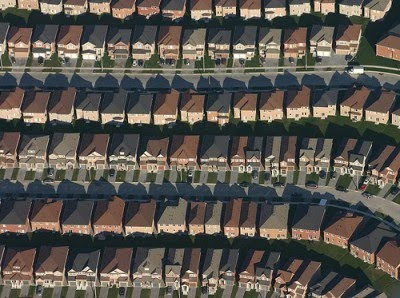 Homes are bigger and there are more of them. Working people want to fill those homes and banks wanted working people in them. So what happened? Good paid professionals lost their jobs. This is what is going on right now. I would live in fear if I were to own a home in the range of 150,000 to 300,000 range. Especially if it was a cookie cutter type home that depreciates in value like a rental car Kia. A home where the chimney falls down because of a stiff breeze (real life example there). I would ask myself "what if I lost my job right now?". It's a frightening thing, that. What we are witnessing in the country right now is just that. Cheap gargantuan homes with gargantuan loans and people in them that have lost their jobs. Reading through the comments on the article makes me sad. It's not about government handouts, lazy bums, NeoCONS, faux news, welfare, uncle Obama. It's about folks who got more of the American Dream then they could afford. Is it their fault? That is debatable. The fact that remains is this; these jobs that a lot of people are accustom to having and being paid a lot for are not coming back. But rest assured, other jobs will. It seems that we, as a country walked to a high mountain peak and fell off. It's high time we started looking back at that peak and think twice about going back up it. The harder row to hoe is not one that leads to riches from climbing the highest peak (to keep with my lame analogy) but the one that leads to stability, honesty and fair wages for hard work. Things that I, myself, have not succeeded in attaining (in fact, I have trampled them most of my life) but strive to achieve. Pray for those who are in financial distress. Pray for those who don't know what tomorrow brings. It's a terrible feeling.